Matte CD Jewel case back traycard inserts for laser or inkjet printers, scored on the title edges for easy folding. Two per sheet. Recommended for Inkjet printers or laser printers. 32lb stock. 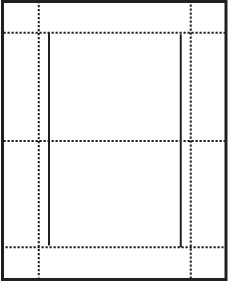 Diecut into 8 1/2" x 11" sheets perforated with micro perforations. Tear out size is 5 7/8" x 4 5/8", which is a custom fit for the back traycard insert area of a CD jewel case.